I first met Corrina in 2007, she was organising a library shoot for me in McLaren Vale. She’s sixth generation McLaren Vale. The next time we met was five years later at the Grange Growers’ lunch. It was December 14th, 2012, and I was taking the final shot for the Grange Book. Winemaking used to be almost completely a male domain, but now Corrina is part of the new breed of young female wine makers. 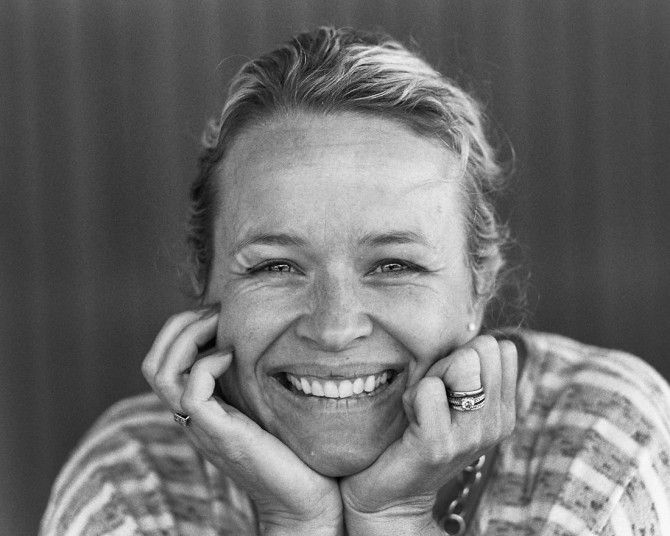 She’s the winemaker at Oliver’s Taranga Wines and a Penfolds grower. Together with husband Dan they have two kids, a 16 hectare family vineyard and have just started a small brewing company, SWELL. I’m one of the owners and the winemaker at our family company Oliver’s Taranga Vineyards. Together with my cousin Brioni, we do all the things that go into running any small business – we wear many hats! Dan and I have also started a new craft beer company called Swell Beer. I am mainly chief taster and support worker on that one! I’m also a mum to our two kids, Miah 13 and 5 year old Koen. I was born in this area. Haven’t moved far, but travelled a lot. I now live with my family in what was my great grandparents’ house on our vineyard, just up the hill from the winery near d’Arenberg. My earliest memories are smells of wineries, cellars, barrel sheds, olives on the wooden benches. As I grew up I thought it was important to travel, so I did that for a couple of years. Young Australians need to get away and have a look at the world. It’s not until you go away that you realise how good it is here. My father was involved, he was general manager at Kay Bros for 28 years, and mum’s family ran vineyards. I grew up in farming and the wine business. Originally I wanted to be a lawyer, but I quickly realised I didn’t want to wear a suit every day. I did however going to uni and do commerce, with the idea of doing a commerce law double degree. While I studied I worked at many cellar doors in the region. Even though the wine industry was in my blood, I was really nervous as a female going back into it. I was very interested in wine, but not sure my palate or my knowledge was good enough. I finished commerce and went on to study oenology at Adelaide Uni. As I started studying, everything I had learnt through osmosis over the years simply added more layers to my knowledge. Technically I realised I really did have a good base to build on. That was followed by two years further study as an exchange student at UC Davis University in California. How did you become a grape grower ? Dan and Koen at the family vineyard. Photo : Corrina Wright. It’s because of the land, it’s my family land and I’m the sixth generation to work this property. We all see ourselves as caretakers. It’s been interesting times over the years, going back to the female thing and the land. My mother was never allowed to even consider working on the farm, girls just didn’t do that in her day. I’m sure she regretted that, but she could also see I was determined to do my own thing. She asked one day if we wanted to buy her section of the vineyard and we did. Lucky my husband Dan’s a viticulturist! The vines are about 25 years old. So really while I’m a winemaker, I’m also a grape grower. It is important to me to continue the lineage. We are a farming family and like many others, we have gone from boom to bust over the years. The company ‘Oliver’s Taranga Vineyards’ was set up by my uncle Don Oliver, his brother Morris and I in 1994. At that time I was working as a staff winemaker for Southcorp. Labels included Seppelts, Rosemount and Lindemans. I worked on many big volume wines including Bin 65 Chardonnay. At that stage Bin 65 was massive, over 18,000,000 litres a year. When the Fosters takeover happened, the timing was perfect so I put my hand up for a redundancy. While I’m trained as a winemaker, I grew up in these vineyards and was happy to return. You run your own winery. What’s the story with supplying fruit to Penfolds ? 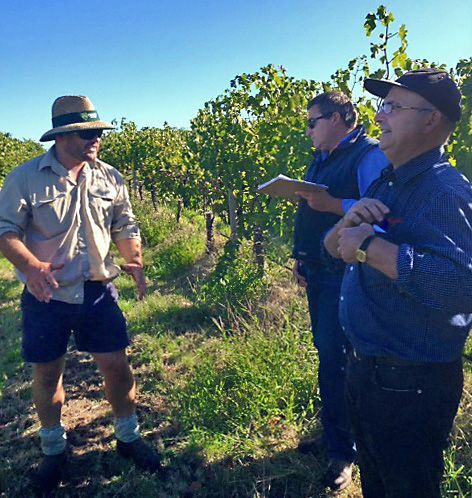 Dan, Vaughan Cooke (Penfolds Grower liason Officer) and Steve Leinert sampling during vintage. Photo : Corrina Wright. It makes a massive difference to our economic sustainability when our fruit gets selected for Grange. Plus it gives our vineyards credibility. We don’t make a big deal of it, but the ‘Grange Growers Lunch’ yearly photographs all hang proudly in our Cellar Door. Don and Dan are striving for Grange quality all year long and this drives the whole vineyard forward. We get the best quality fruit we can grow on this estate. For me as a winemaker that’s a real benefit because it helps me make better wine. It’s Dan’s and my aim to make Grange as often as we can. It’s a great brand association. I mean, who wouldn’t want to be associated with Australia’s most famous wine? 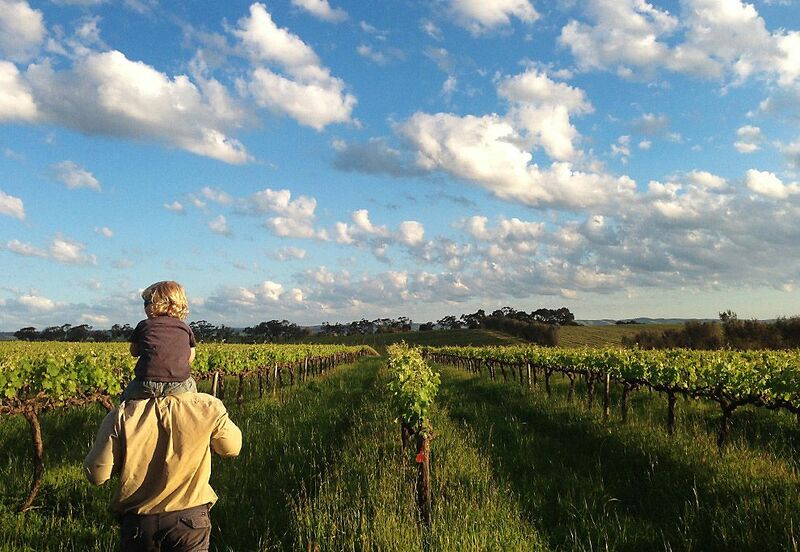 How did you become a Penfolds grower ? When Dan and I bought the block from mum, the vines were about 20 years old. Very early on it had been contracted to Southcorp. Briony Hoare was working at Rosemount and with some of our fruit Briony did something special. We are not sure what, but back then it ended up in Grange, even though it was made at Rosemount, which to this day is most unusual. At the same time the guys from Hardy’s Tintara were also keen on the fruit so mum decided to contract the grapes to them. Paul Carpenter was keen to get our fruit into Eileen Hardy which happened, but then things changed. A new price structure – which we felt was unfair. We got paid very well if our fruit was good enough to go into Eileen Hardy Shiraz. In anything else other than Eileen Hardy, the payment was significantly less. We’re talking $9000 a tonne for Eileen, down to $1000 if not Eileen! Unfortunately that’s the story for many Australian grape growers. We were trying to do our best, but we were taking all the risks. When we bought the vineyard, we asked to have the contract cancelled and rang Penfolds straightaway. It was a good move and has been a great relationship. The first year we got into St Henri and the second year we made Grange. We have now made Grange three times in five years. I like the way Penfolds work. I worked in the ‘Classification’ tastings when they select the parcels of fruit for each wine. I know it’s unbiased. Only the best of the best make Grange. We feel quite honoured to have made the cut so often. Don has made it in more than 10 times! Don was quite vocal around 1996 in regard to wine grape pricing. From what I can gather, back then he was getting into Grange quite regularly but not really getting paid much more for it. The ‘Grange Growers Club’ started around then. Your fruit regularly makes it into Grange. What do you need to do as a grower to make the final blend ? While most of the fruit for Grange comes from the Barossa, our fruit often makes the grade. When it does, it’s great. Having dealt with Penfolds for many years, I know the style of fruit they are after for Grange with concentration, density and the tannin structure. The Penfolds winemakers tell us we bring in some of the floral characters, some of the lighter aspects, whereas the Barossa parcels can be super big, super dense and much more chocolatey. It’s all about growing the right volumes. We are lucky because we tend to have low cropping vines anyway. I think it is more about the patch of dirt and letting the vines do their own thing as much as possible. We have control over the irrigation which we are very careful with, but we don’t have control over the weather gods so it is an education every vintage! Favourite wine style, any memorable wines ? 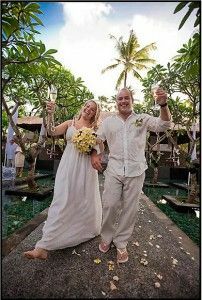 The Bali Wedding. Photo supplied. That’s easy, Champagne. I can’t make it here in McLaren Vale of course, but I love it. My most memorable wine? The Penfolds 1962 Bin 60A. Prior to one of the Southcorp winemakers’ dinners, we were each given an historic wine to present and discuss at the dinner. Somehow I was super lucky and got a bottle of 1962 bin 60A to present. It was like “holy crap, have a look at that wine!” It was so good, just a ridiculously good wine. It’s funny, memorable wines are not only at special occasions. Other occasions are just as special. Some of my favourite and memorable wines, not the expensive or great quality ones, have been at ordinary places with great friends, special food and some random Italian varietal to wash it down. My favourite Champagne is Salon. Champagne Salon is a small producer of critically acclaimed Champagne made in the blanc de blancs style. It’s simply delicious, you don’t want to know what it costs. We had our wedding in Bali. Somehow or other we got three bottles – it was fantastic. The guests were asked not to bring any presents but to bring Champagne. It was all put together and poured throughout the day. We had the best time. But the Salon had a note on it ‘For the Bride and Bridegroom only’ !! Participating in the 2005 Len Evans tutorial was a real highlight. It was ridiculous , full of hundreds of amazing wine experiences with some of the best in the business. Packed with inspiring people, unbelievable wines and great food the whole experience was excellent. 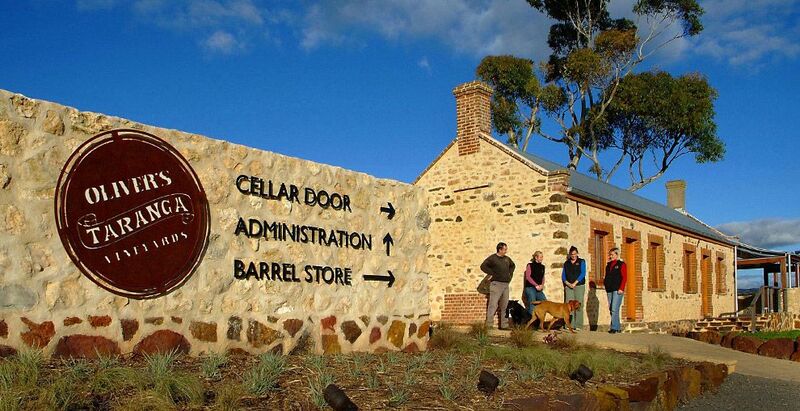 Opening our cellar door in 2007 was a real highlight. Pretty much the entire town attended and it was such an awesome celebration and the culmination of so much work. 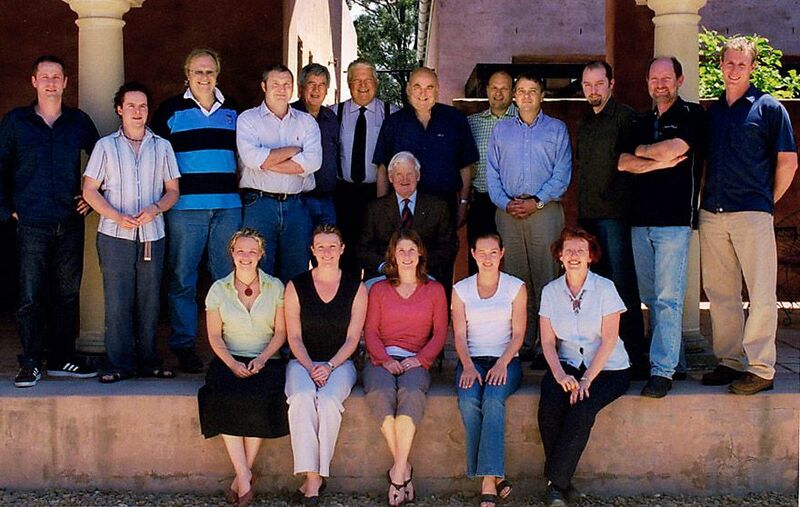 The Len Evans 2005 Tutorial team. Len Evans is seated, Corrina is bottom left. Photo supplied. Tuna Carpaccio. I’d have a 1996 Salon with it on our local beach Port Willy. Fresh Mulberries for dessert. Or maybe the Maldives, I’ve never been there. Being a mum, obviously my kids. Patchwork quilt making, I play some netball, love to travel and eat pig. 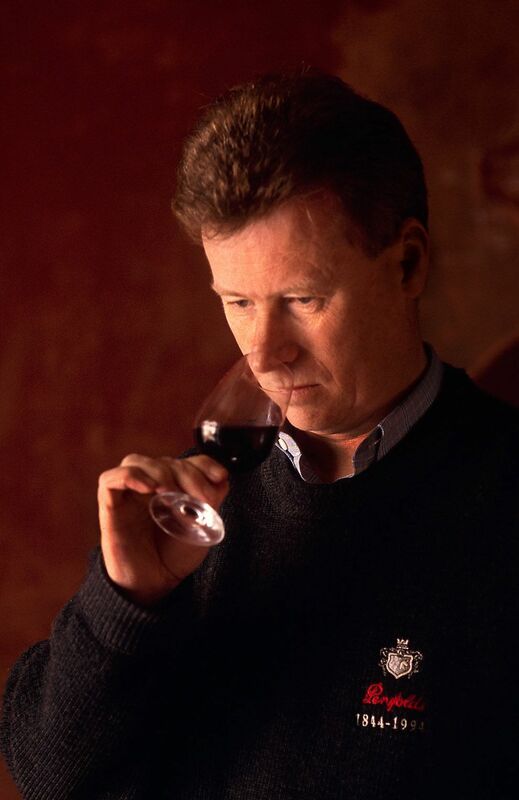 John Duval, former Penfolds Chief Winemaker. Photo Milton Wordley. Loads of people. Family obviously – my mum, dad and especially my grandfather. John Duval and Peter Taylor got behind me back in the days at Penfolds. They really helped me get a scholarship to study in the United States. I needed a certain amount of money in my bank account – from memory $20,000 to be accepted into the scholarship. I didn’t have anywhere near that. I put together a proposal to work on a project with them in the hope that I would get some sponsorship. John and Peter really supported me through their internal graduates program and pushed for it. I got it and spent two years in the States. I get really inspired now by a lot of the other female winemakers. Winemakers like Sue Bell, Sam Connew, Kerri Thompson at KT and the Chalmers family. I have a lot of respect for those that have gone out on their own. And some of the oldies in area like d’Arry Osborn. I think ‘d’Arry is 85 now. I should know – his birthday is the same as mine. I thought about this for quite a while. I do this because I feel like my family and I are the caretakers of this land. This land has been in my family for a really long time. We need to make sure this land is viable, both environmentally and financially. It must be sustainable for another six generations. We used to be mixed farming but now it’s a vineyard and have valued-added with the wine business. It’s about the sustainability of this land for the next few generations of my family.